Sure, it’s easy to delete apps from the iPhone or iPad. Simply tap and hold on any icon, see the wiggle dance, and tap the red X button. But sometimes you’ll want to make a choice about which apps to delete based on more objective criteria than, “meh. I dont’ want this game anymore.” Like when you run out of room on your iPhone, for example. How do you know which ones to dump? Today’s tip should help. For devices running iOS 5 and later, the way to do this is hidden in the Settings app, in the General tab, under Usage. This is where you can go to manage your iCloud setting, as well. But in addition, you can manage the apps on your iOS device. Once there, you’ll notice (after a small delay if you have a lot of apps) that your on-board apps are listed in descending size order. In other words, the apps that take up a lot of space will be listed first. Tap on any app and you’ll get even more info, including the version, the size of the app, all associated media, and the size of the Documents & Data. Just below that, you’ll have a Delete App button in “danger” red. At the very bottom, you’ll see how much space is available on the device itself. Deleting apps that take up too much space can be helpful when you’re trying to install new apps, of course. You may even notice apps that have a lot of storage attached to them that you weren’t even aware of, like internet radio apps that sync songs to your device to play during the time you’re not connected to the internet. 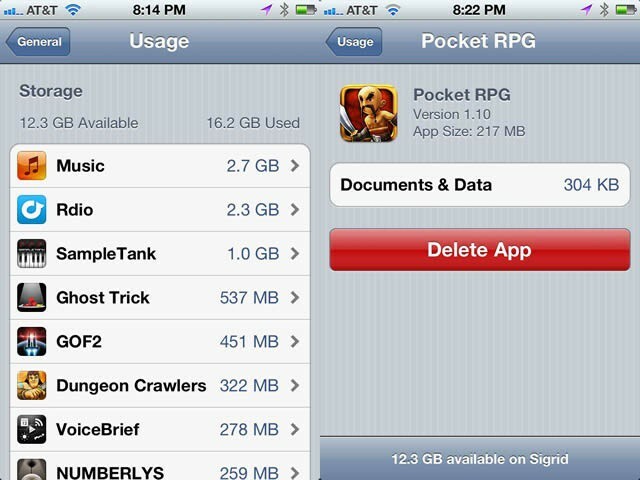 Deleting apps this way can really give you an advantage. Because remember, knowing is half the battle. Got an iOS tip of your own? Need help troubleshooting your iPhone, iPod touch or iPad ? Drop me a line or leave a comment below.